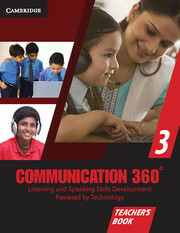 Communication 360° is a listening and speaking skills development solution for School and Home use. 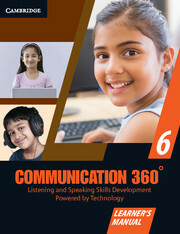 Communication 360°, a technologically advanced learning solution, makes English learning a fun experience. The effective listening and speaking skills development technique helps learners communicate effectively and with confidence while allowing them to interact within relevant contexts. The learner-centric solution has been designed to unlock the potential of the new age learner. Using the VAK model, it offers a blend of School and Home use components developed on the basis of real-world practices for learning methodologies. It offers multiple self-paced and guided practice opportunities. The programme regularly tracks the progress of students to help them improve at the right time. Provides Contextual Teaching & Learning. Confidence building via multiple guided practice opportunities post optimum exposure. Listening and Speaking skills honed through improvement of sub-skills, grammar, vocabulary and pronunciation. Learning made enjoyable with interactive games and other fun-filled activities. Analytics to track regular performance of all the stakeholders through Progress tracker. Speech Recording Engine to work on pronunciation during the learning process. Pre-, mid- and post-training, scored assessments.